Best Start Hub is aiming to create a garden space, outdoor sensory area, music wall, water centres and other motor skill play areas for the entire community to utilize. Two Die-alogue events (one in Thunder Bay and in Manitouwadge) will feature Phoebe, an inquisitive and precocious puppet who will lead a discussion with parents and teachers about how to best talk to children about death. An Kevlar canoe will be purchased for the Outdoor Education component of the Explore Program, including Swim to Survive and Canoe Safety lessons. 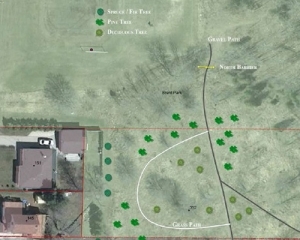 Two trail cameras and a weather station will be purchased and installed in the existing outdoor classroom to further the students’ outdoor education. The purchase of equipment (iPad mini, a green screen, lights, and microphones) will provide the Intermediate Leadership Team with the tools necessary to utilize green screen technology to engage the entire school community in mentoring/communication projects. Using community partners, this project will build an outdoor hockey rink to be maintained and used by all students. A spring powwow and other events will help Indigenous students develop leadership, organizational, social and teamwork skills, and share their culture with non-Indigenous learners and the school community. A one-year pilot program initiated by the Red Lake Indian Friendship Centre in which residents pre-order a monthly food box that will provide them access to fresh produce at an affordable cost. The installation of a walk-in cooler and walk-in freezer would allow the Thunder Bay Food Bank to store several weeks of fresh produce and frozen meats. 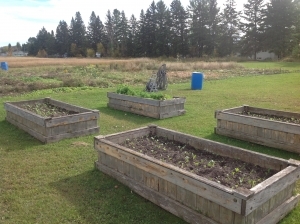 The Rainy River Community Garden is in need of 2 raised beds and a mini facelift. The garden has been full since its inception 6 years ago. 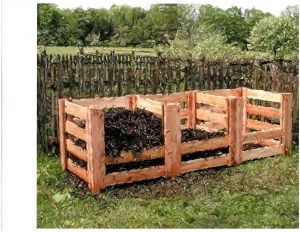 As the community ages, we’ve noticed a higher demand for raised beds. The ‘Soilmates’ are residents, permanent and summer, of the Municipality of Shuniah who are in the third year of gardening. The community gardens are located at the grounds of the MacGregor Recreation Centre on Lakeshore Drive. 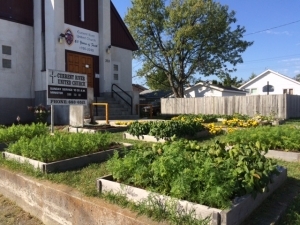 Current River United Church has garden plots at the front of our Church on Morse Street where we grow fresh vegetables for our neighborhood food cupboard (food bank), The Current River Churches Food Cupboard provides assistance to individuals and families in need in the Current River area. 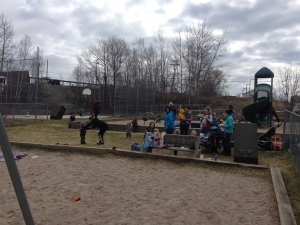 Our neighbourhood, in Cochenour, ON, would like to build more seating in our Municipal park. We are a small community within the Municipality of Red Lake, ON. 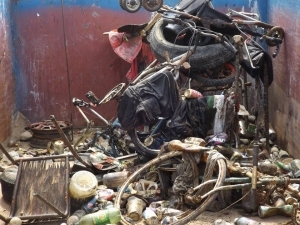 Clean up of the area’s public swimming areas. Last year we had 12 divers along with 15 volunteers from local service clubs (and the general public were topside) to help with the retrieval of debris that divers recover from the bottom of the lake. Hydroponic Farm Wall – Students will be able to explore the future of food with a vertical hydroponic farm wall right in Claude E. Garton’s science lab. They will use the garden to inspire innovation, increase food security and access to healthy food, develop community and make change. First Nations After School Art Collaborative – High risk youth from 24 remote Northern communities will take part in an after school arts program in collaboration with the Thunder Bay Art Gallery, building self-confidence and social skills while working on projects that will be featured at the art gallery. Safe Drinking Water & Healthy Foods – Water at the Nestor Falls School is unsafe for consumption. Students will get their own reusable water bottle and water jugs at the school will be filled. Cooking classes for students in Grade 4-8 will plan and prepare a healthy meal for students once a month. Outdoor Garden – The school will enhance its garden with seating, garden boxes and trees. Students will learn about agriculture, biodiversity and pollinator species. The space will also be available to the public during off-school hours. 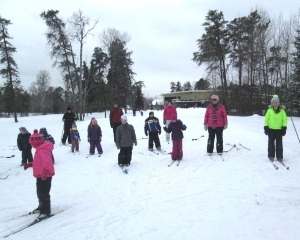 Trail Enhancements – The Atikokan-based volunteer cross-country skiing organization will replace a small bridge and dedicate a grooming sledge to help its Jackrabbit youth program engage in a healthy, outdoor activities. Green Space Revitalization – Neighbours in the area got together in 2013 and transformed a green space that was in disrepair into a thriving and welcome addition to the area. They will enhance the space even more with a bat house and various mature trees. 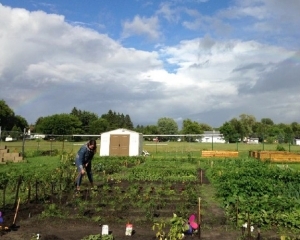 Community Garden and Kids Garden Club – The volunteer club in Fort Frances’ north end has turned an overgrown grass field into a flourishing meeting place for the community. The grant will help to provide free tools, equipment, ground plots and raised beds for gardeners aged 3-83. 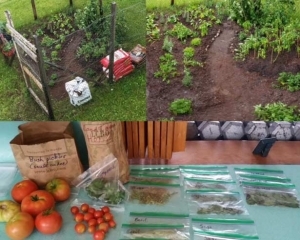 Community Garden – Sapay’s garden connects the entire community and everyone shares in the work and the fruits of its labour. They will enhance the garden with raised beds to increase production. 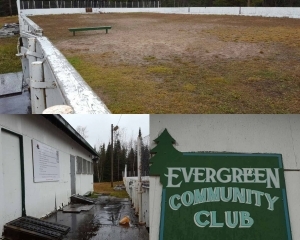 Hockey Rink Renovation Fundraiser – The club will bring the community together to host a road hockey tournament with an outdoor barbeque and other activities to raise funds and help revitalize the outdoor Evergreen hockey rink with new boards and lights. 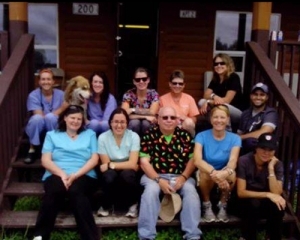 Spay and Neuter Program – Since 2013 the community has been helping unwanted and unfixed animals, bringing a veterinarian team to spay and neuter animals and update vaccines. 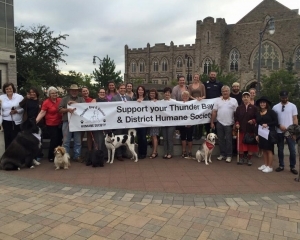 They also find new homes for dogs in Kenora and Fort Frances. Spay and Neuter Program – In 2016 the humane society took in more animals than it ever has before. They will spay and neuter every animal before it’s adopted in order to help control the district’s pet population. 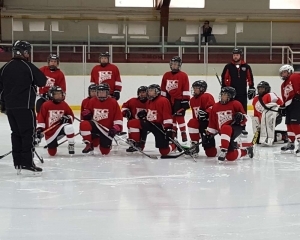 Holiday Gifts for Children’s Aid Society Families – The Hurricanes will donate food, presents and other items to families in need to teach the young hockey players about compassion and community caring. Go Girls and Game On Youth Program – Youth in grades 5-8 will participate in fun and interactive activities about living and maintaining a healthy, active lifestyle. The programs will be enhanced with craft supplies and new equipment. 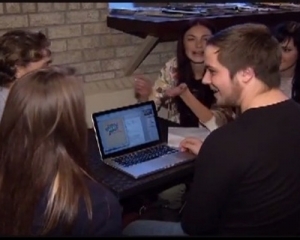 Student Leadership Conference – NWOSSSA plans three conferences for students every year. The organization will be able to help cover some of the cost of venues, materials, supplies and guest speakers.